After two successive 1-1 draws, Nottingham Forest got their first win of the new Championship season after edging out Reading 1-0 at the City Ground. Manager Aitor Karanka went with the same 11 who drew with West Bromwich Albion in midweek, but it was a substitute who proved to be the match winner, Hillal Soudani coming off the bench to make himself the hero. The game’s first chance arrived in the 13th minute and it went to the visitors. Mo Barrow neatly slipped the ball through for Yakou Meite in the area and he saw his low shot saved well by the legs of Forest ‘keeepr Costel Pantilimon. Forest’s first real opening came ten minutes later. Joe Lolley cut inside from the right wing and saw his shot deflect out for a corner. Just after the half-hour mark, the home side enjoyed their best period of the game so far as they forced several successive corners and then, when the ball was eventually cleared, Danny Fox tried his luck from 30 yards but saw it blocked by defender Paul McShane. 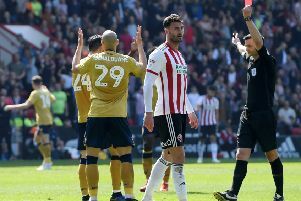 They were then nearly gifted an opener as Lewis Grabban pounced on some indecision by defender Tiago Ilori, going through and seeing a shot saved by Vito Mannone. In the final seconds of the first half, Forest almost cut their opponents open. Ben Osborn sent a raking ball forward and he found Gil Dias running into the area but the on-loan Monaco man couldn’t contact with his attempted volley after controlling the ball on his chest. It was Reading who had the strongest of the early chances in the second half. A free kick was floated into the area and Yakou Meite rose highest at the far post, but he was unable to direct his header on target. The Royals then went close again as Jon Dadi Bodvarsson outmuscled Tobias Figueiredo before fizzing a shot into the side netting. Forest’s first chance of the second half came just before the hour. Ben Osborn skipped down the left flank and his drilled cross was acrobatically volleyed just over the bar by Matty Cash, who had only just entered the field as a substitute along with Hillal Soudani. In the 68th minute, Forest broke the deadlock. After the Reds ventured into the Reading area, the ball rebounded to Hillal Soudani who, in his first real involvement since coming on, bent a delightful effort across goal and pass the dive of Mannone. With less than five minutes to go, the hosts almost wrapped up the game. Cash raced down the right and drilled a shot into the chest of Mannone and the rebound eventually made its way back to him, but he bobbled a second effort onto the roof of the net. FOREST XI: Pantilimon (GK), Figueiredo, Fox ©, Guedioura, Colback, Grabban, Carvalho (Cash 56’), Osborn, Lolley (Robinson 78’), Darikwa, Dias (Soudani 56’). SUBS NOT USED: Smith (GK), Watson, Murphy, Dawson. SUBS NOT USED: Walker (GK), O’Shea, Swift, Clement. ATTENDANCE: 27, 948 (826 away).